The Golden State Warriors overcame a 25-point deficit on Sunday to beat the San Antonio Spurs 113-111 in Game 1 of the Western Conference Finals. However, more than the comeback, the biggest story of the game was Kawhi Leonard's ankle injury that took him out of the game in the third quarter. At the time of Leonard's injury, the Spurs had been in commanding control, building a double-digit lead, up by 20 at halftime and 21 when he landed on the foot of Zaza Pachulia. Leonard shot two free throws then left the game for good. From there, the Warriors took over. They promptly went on an 18-0 run, getting right back into the game. So, how much does Leonard mean to the Spurs? The Warriors outscored the Spurs 58-33 after Leonard left the game. 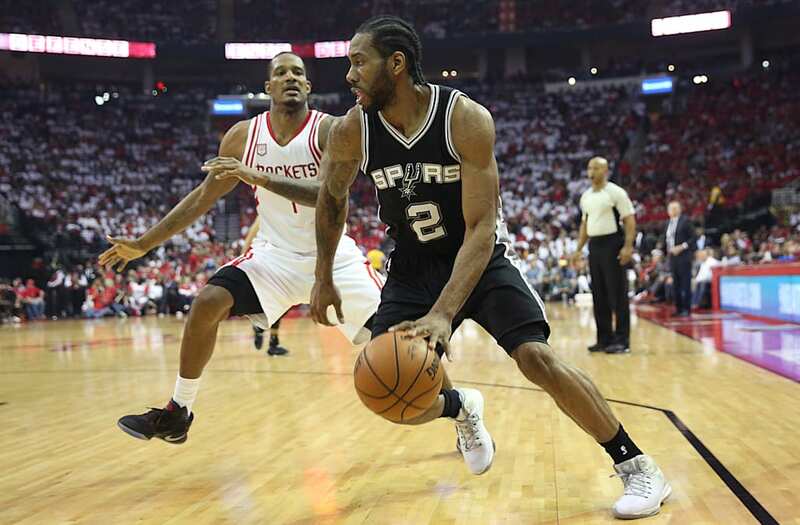 In 24 minutes, Leonard had 24 points, six rebounds, and three assists and was a +22. Of course, any team would miss their best player — Leonard is a top-five player in the NBA and an MVP candidate. But he's particularly important for these Spurs. He controls most of the offense, and he essentially puts out fires for the Spurs on both ends of the floor. Need a bucket? Leonard will get it. Leonard has also become an improved playmaker over the years. And Leonard's best skill — his ability to switch onto any opponent and wreak havoc on the defensive end. In fact, Leonard, a two-time Defensive Player of the Year, is such a menace on the defensive end that the Warriors schemed around him entirely. In Leonard's 24 minutes, he didn't defend a single shot, according to the NBA's Stats site tracker. The Warriors simply avoided him by going wherever Leonard wasn't. The Warriors are so talented and tough to match up with that the Spurs may have been in trouble, anyway. Leonard or no Leonard, it's tough to imagine a scenario where the Spurs could beat these Warriors four times in seven games. That's part of what makes the Spurs' Game 1 collapse so heart-wrenching — steal Game 1 on the road and they may have a shot. None of that matters without Leonard. If Leonard misses even one game, the Spurs are likely looking at the end of their season.